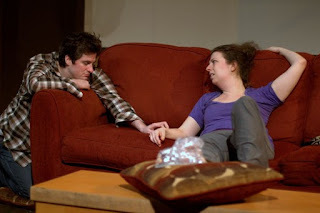 Brandon Ryan and Kiki Abba in MAP's latest production. PG: Not only are the MAP Trivia and MAP Games events incredibly fun, they are our monetary life-blood. As a small indie arts company, instead of organizing ourselves like a smaller scale version of the regional theatre model, we decided early on that we would eschew that "traditional" model and rather try to find a way that made sense to us. For us, this included fundraising. With individual donor contributions as well as organizational funding waning across all of the non-profit arts sector, we tapped into an event model. RJ: How does that event model work? PG: Throw events that regular people, not just arts people, want to come to and are willing to pay for, and use that to fund our art. We, especially Brandon (Ryan, artistic director), are pop-culture nerdlings. We love throwing these events and meeting a ton of new people. The money we make allows us to do a thing we love even more, produce theatre. RJ: How do you categorize your current production at 12 Ave Arts? PG: The first catch-phrase I used to describe “Belleville” was "a Hitchcockian domestic thriller." It has serious themes, as all of MAP's work does. It's also occasionally hilarious. RJ: What drew you to Amy Herzog's script? PG: I remember reading the play for the first time, and feeling a sense of distinct unease from the first few pages. That is rare when reading a play. It was a real page-turner and I wasn't sure how it was going to resolve until it resolved. That is so uncommon! RJ: How do you feel about the couple at the center of this story? PG: I had complicated feelings about our two lead characters, and about their relationship. I found that it was not so easy to categorize them or their actions into "right" and "wrong." Rather, it felt very real; a situation not so many steps away from ones that I or my friends might have found ourselves in. "There but for the grace of god go I..." And I like that. A lot. Amy Herzog herself calls this play a horror, and I think that's why. RJ: As a director, what's your role in keeping the audience guessing? PG: Great question! Pacing, mostly; and a delicate hand. The story needs to unfold as it unfolds. I need to know where the clues are dropped, but there's a danger in highlighting clues too boldly that they become obvious. It's more like dropping breadcrumbs, and trusting the audience to follow the overall trail, even if they miss a few of the crumbs along the way. Audiences are so smart! Way smarter than they think they are. They'll get it. PG: I also believe that sentimentality is the death of the thriller (and of comedy, and of tragedy, actually). The key to the most truthful and most effective story is not loving any single element of the story too much that it overshadows the uneasy and discomfiting parts of the story. You have to see the whole thing with clear eyes, warts and all. For more information MAP Theatre’s current events and shows, see their website.